Miniland’s Monster Truck is a ride-on truck with rollover-resistant bars in the front and back to avoid tip-overs. 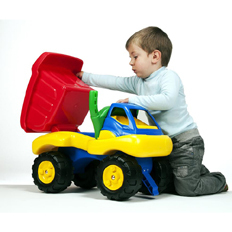 It includes a tilting dumper for loading and unloading and it is made of strong durable reinforced plastic. 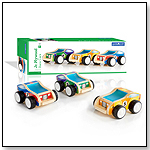 These vehicles can be used both indoors and outdoors for hours of imaginative play. No batteries required. Made for children ages 2-6 years old.